Each Le Cache model has three colors to choose from. 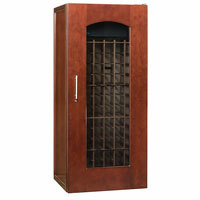 Each model is fully loaded with solid cherry wood doors and an ultra-quiet CellarPro cooling system. Le Cache has also updated the design of the cabinets to feature contemporary windows, universal cherry wood racking and top ventilation for zero setback installation. Comments: I was stunned when I began loading our new Le Cache Model 1400 and found 135 bottles stored in cabinets and closets representing $10.000. Now our investment is protected and will appreciate. Comments: Le Cache is a first class organization delivering a superior product with outstanding service. I highly recommend their products! Comments: The wine cellar is great and matches my dining room furniture perfectly. Quality is superb and I am very pleased with the personal customer service. Comments: Looking forward to having the Model 1400 make our wine experiences even better.